This post provides my Pro Blogger book review, along with some of my favorite quotes from the book. 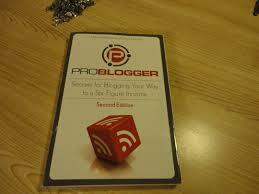 I love the book Pro Blogger: Secrets for Blogging Your Way to a Six Figure Income by Darren Rowse and Chris Garrett. As a full-time blogger myself, I can attest to the value in this book. It is filled with valuable tips. I first learned about Darren and Chris, and their book, while I was watching some YouTube videos a couple years back. Up until that time I had never heard of either of these two gentlemen. But after watching the video, I clicked on a link and visited their Pro Blogger blog. From the time I first visited their website, I was in love with the VALUE they provide other bloggers. This led me to subscribe to their email list and to buy their book Pro Blogger. I’ve read the book at least five times now and I have built my entire blogging business around the information I learned from the book. Within a few short years, I’ve been able to earn a full-time income by blogging. No, I’m not rich yet, but I do make enough to pay my bills and work from home full-time (I don’t have a job), so I’m very happy. The book is absolutely jam packed with great information about the “how to” and the “big picture” of successful blogging. It is so good that it’s now in its third edition. The book comes in paperback and has 336 pages. It was published by Wiley Publishing. What I would like to do in this section is share my top 24 quotes by Darren Rowse and Chris Garrett from Pro Blogger. These are passages that I highlighted or underlined while reading the book. Each quote is in bold and italics. After the quote I provide my insights and point of view. 1. Blogging for an income takes time. All businesses take time to build. Don’t expect to start a blog today and be making a profit within your first year. You might make a little money, but you have to invest your time and energy for a few years before you can expect to make any type of decent income with a blog. Plan on it taking at least five years of daily effort to build a successful blog if you are doing it part-time. 2. It takes hard work and discipline. Most people think that running and building a successful blog is easy. It’s not. Anyone who has ever built a successful blog will tell you that you must roll up your sleeves and work like a dog for the first few years, just to get it up and running. You also need the discipline to work on your blog every day and follow through with what you started, even after the initial enthusiasm fades. Success will not happen by accident. 3. Put your reader and content first. Don’t let your desire to make money overtake you. Put your visitors first and the money will follow. Put the money first and you will be out of business before you ever get started with your blog. Without a loyal audience you won’t make much money blogging. Focus on building your tribe. 4. Write reviews only for your products you have used. Never risk your reputation by recommending or endorsing a product or service that you have not tried yourself. Don’t let the opportunity of making a quick buck violate your good common sense. Protect your reputation like your life depended upon it. 5. Trying to be all things to all people is a trap that some people fall into. Find a niche and fill it. Find a select, targeted group of people and focus on building a relationship with them for the long-term. The tighter, more defined your niche the better. 6. There is little logic in starting a blog on a topic that you have no interest in yourself. Blog about something that you are passionate about. Find something that sets your world on fire and let that be the topic of your blog. That way you never lose interest in blogging. If you choose a topic that doesn’t interest you, you won’t stick with blogging long enough to succeed. 7. It’s better to be a big fish in a small pond than a small fish in a big pond. Once again, target your niche. Find a small, defined group of people and focus on them exclusively. The broader your niche, the harder it will be for you to succeed. It’s better to be number one with your small niche that be number one million in a big niche. 8. Start with the customer – find out what they want and give it to them. Get in the mind of your customer and website visitors. Ask them questions and find out what information they are looking for and then give it to them. Think like your reader! That’s why it helps to write about something you have experience with or something you are passionate about. 9. Great content is expensive no matter how you look at it, in terms of talent, ideas, time or money. To succeed with blogging you need great content. Cheap, low quality content will not get you anywhere. You have to be willing to invest your time and energy to create that content or you need to hire someone else to create that content for you. Remember, you get what you pay for. Hiring the cheapest writer probably isn’t the best idea. Never skimp with your content. 10. Great content is worth a premium because it is what your visitors will be coming to see. Same as the previous rule. Without great content people won’t re-visit your blog. 11. A blog’s value depends entirely upon the buyer. When you’re looking to sell your blog, it doesn’t matter how much you think your blog is worth. It only matters what an interested buyer, with the funds, will offer you for it. It’s like selling a house. You have an appraisal and a starting point, but it doesn’t mean your house will sell for that amount. 12. Going from zero to a decent sized audience is one of the hardest parts of blogging. Getting up to 1,000 unique visitors per day will probably take you a few YEARS to do. But once you get to that point, your blog will grow much faster. You simply need to get the momentum going. Once the momentum gets going though, life is much easier. 13. A blog is not going to make you much money if no one reads it. Without an audience, your blog won’t earn anything at all. 14. Links from other blogs are your best best source of new subscribers. Make it a point to connect with other bloggers in your niche. Leave comments on their blog and ask them to link to you. Also, ask about guest posting on their blog. This is your best, highest quality source of traffic. 15. Networking is critical, so join forums, email lists, and newsgroups within your niche. Just like the traditional business world, you have to network with other people and businesses. Get your name out there by connecting with other bloggers, participating in forums, joining focus groups, participating in social media discussions, and doing whatever else you need to do to meet new people. Attending live events in your niche is also a great option. 16. The best way to get links to your blog is to write quality content that people will want to read. Rather than focusing all your time trying to buy links and build links, it’s much wiser to simply create content that people WANT to share and link to. Create high quality content and you will get plenty of free links. 17. Avoid duplicate content as much as possible. This is simple advice. Don’t post the same article or information in more than one spot on the internet. Keep your original content exclusive to your blog. The search engines hate duplicate content (when you post the same article to several sites) and you might get penalized for it. 18. Keeping your readers engaged and coming back is just as important as finding new ones. Remember it’s cheaper and easier to keep a current customer than it is to go out and find a new customer. Stay in touch with your visitors and keep building a relationship with them. Spend 80% of your marketing efforts on keeping your current visitors/customers and the other 20% on finding new ones. You do this by using an auto-responder and sending frequent emails. 19. Blogging is a long-term thing. Blogging is not a get rich quick type of deal. Like any other legitimate business, it will probably take you one to three years to get profitable and five or more years to make any type of significant income. 20. Most of the top blogs are written by multiple authors. This is a HUGE point that most bloggers mess up on. The sooner you hire other writers and outsource some of your content creation the better off you will be. Trying to be a one trick pony and doing everything yourself is a big mistake. From day one you should hire other writers to help you. 21. The vast majority of successful blogs show advertising, with less than a quarter using Google Adsense. AdSense is a great way to make money with your blog in the beginning, but most of the big, successful blogs don’t use it. That speaks volumes. Once your blog has significant traffic, there are much better alternatives available to make money. 22. Be a hub and a connector. Think of your blog as your hub of operations. This is where you provide great information and send your visitors to other sites with great information. You want to link to other quality sites, too. Ideally, you want your blog to be where people in your niche go at the start of their internet search when they are looking for information. 23. Forget attention seeking and create value. Don’t worry about attention or hype. Spend all your time over-delivering. Give your customers a good experience by providing exceptional content and value. Do that and everything else will fall into place. 24. Perhaps the most important thing I did from the very first month of DPS was to start a weekly email newsletter. Create a weekly newsletter for your blog, right from day one, and send it out on the same day each and every week. This is a great way to stay in touch with your fans and audience and to make money on demand (via email marketing and newsletter marketing). It works well for me and I know it will work for you too. In summary, Pro Blogger is a great book. I give it five out of five stars and consider it a must read for any blogger or anyone interested in starting their own blog in the future. It gives you the details on how to start a successful blog AND it gives you the big picture of owning and growing a successful blogging business. Best of all, the authors both have experienced tremendous success with their own blogs and are really qualified to share their advice. What are your thoughts about my Pro Blogger book review? What are your favorite quotes and lessons from the book? Leave a comment and let us know what you think. I look forward to hearing from you. You can order a copy of the book on Amazon right here. I’m a big fan of Darren Rowse and was a regular visitor of his blog, problogger, a couple years ago. Quote #3 is very true. Content is the key. It’s all about creating quality content that genuinely provides value to your visitors, gives them the information that they’re looking for and helps them solve the problems they’re looking to solve. #5 is also excellent, if you want to build a successful blog faster, be yourself, it’s a lot easier that way. Yeah, Darren is the man when it comes to blogging. Blogging is a tool I heavily rely on, and it was a learning process. I thought that because I was a good writer and because I liked writing, using blogging in my business would be easy. However, I still struggled in the beginning with creating content people were interested in. That’s because I really didn’t have a focus or a goal. I was writing just to have something versus writing to a specific audience and writing for a specific purpose. Since nailing those items, I have succeeded greatly with blogging and have found it to be an asset to my company. Thanks for the comment Diamond. Blogging has been a huge asset for my business as well. Other than deciding to build a list, it’s probably one of the best decisions I ever made in business. As a blogger myself, I sometimes get so caught up in the SEO factor that I forget that the primary reason is to write quality content. As a matter of fact, this is a huge problem everywhere. As a freelance writer, I find people wanting to hire me to write posts. In many cases, the person wants a variety of keywords and phrases installed throughout the article. They may want a 300 word post with 10 keywords strung out within it. It makes it difficult to write something of quality when you have to worry about all those keywords. I say write the good content, and the readers will come! I don’t build any links for this website. I just try to over deliver with high quality content and let everything else take care of itself.